"The image below shows an advanced placement that will perhaps show the potential of using hexes inventively - the flared crack would not take a normal nut - not even an HB Offset, but the Rockcentric loaded as seen in the image was bombproof because loading the sling just pulled the hex tighter into the placement." I assume there is a pimple of rock above the hex and given the size of the photo it is hard to see where the rock sits and it doesn't look like the sling is threaded ---- it doesn't look "bombproof" to me. I can't see how that would be considered "bomber". Doesn't look like any placement I'd ever be tempted to use. Wouldn't consider that bombproof but then again its hard to make a judgement from a picture. I'd be worried about the sling lifting the hex out. Pulling up on the sling would lift the hex out, but if extended long enough, this shouldn't happen via rope drag. 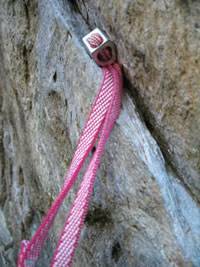 Pulling down on the sling should cause the hex to be wedged down into the crack more. It would appear that the gear is wedged into a lip, and the sling fed out to the side and then down. You guys are limp dicks. It is clearly bomber and I'll be using it next time I need to do a full rope length rap on a single rope. One flick and the baby come down. Awesome! Just another reason why retro bolted rap stations destroy creativity and the evolution of our species. P.S. Don't try and be clever with a "Darwin award" riposte cos I'd always make someone else rap first in a situation like that. In which case you'd be stuck, unanchored on a ledge without a rope? >In which case you'd be stuck, unanchored on a ledge without a rope? Nice try, but I'd just walk down and collect the gear if my partner bought it. We're talkin retroed rap stations not necessary ones. Given this placement is in Spain, I would consider a bolt would be much better! why would you be showing weirdo placements on a lead climbing course anyway? Well I had to laugh given that the lead instructor from the company/website whose page this is from is Silvia Fitzpatrick. I did a fair bit of climbing with Silvia when she was in Australia many years ago and although she is a phenomenal climber we certainly had a difference of opinion when it came to protection and belays. I have no doubt that Silvia is a great instructor and she has a wealth of experience to draw upon. The page in question might not be Silvia's handiwork. As for the placement... I would certainly be reluctant to label it 'bombproof'. It might give you the security to do a move in certain situations, but I wouldn't want to rely on it if it was the only piece between me and the deck. >why would you be showing weirdo placements on a lead climbing course anyway? Agreed. Who in their right mind uses hexes these days? Was it used for aid or lead climbing? Simey had to resort to pulling on pro instead. I will avoid adding to the; 'give simey a hard time'; (NO pun intended. Heh, heh, heh). The placement would be OK for aid to make progress in my opinion, but I would not consider it bomber for free, and would consider it less so, if the climbing above involved a rising traverse out to the right! Hmm. With a much larger population, it stands to statistical reason that there are some silly pommy climbers out there, who would accept this placement without question!